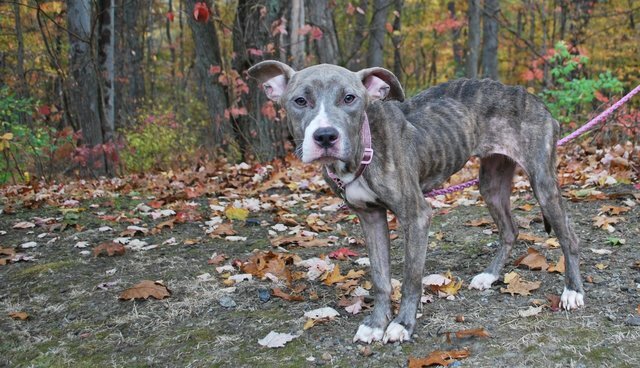 When a good samaritan found Molly in the woods near Cascade Park, in New Castle, Pennsylvania, the gentle pit bull puppy was so emaciated that she could barely move. 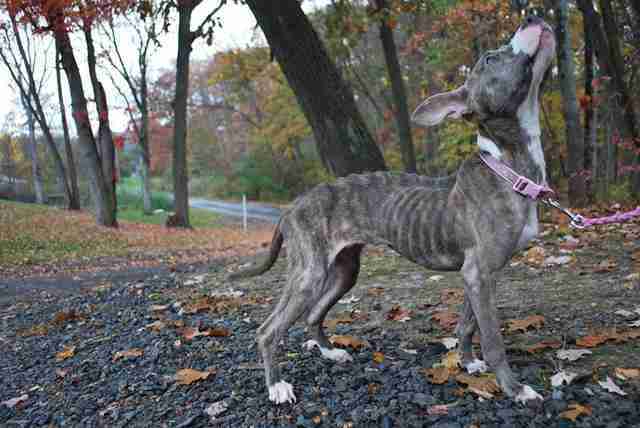 Every rib showed through - it was clear she hadn't had food or water in days. Molly was rushed to the nearby Lawrence County Humane Society for care, and they could immediately see what dire condition she was in. She had to be carried into a kennel. 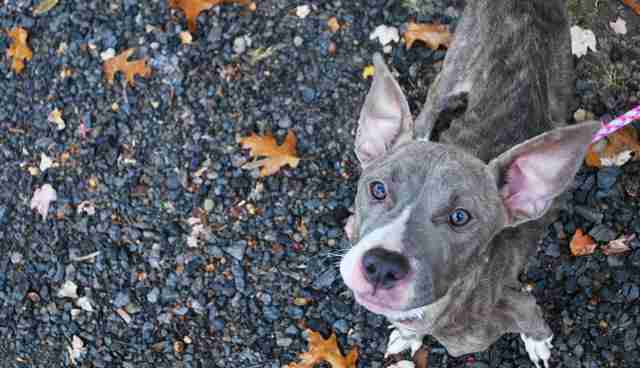 "She had hardly any energy to stand up and walk," Susan Cressman, the shelter's assistant director, told The Dodo. Molly was less than a year old, only a puppy, but she had already been through a lifetime's worth of suffering. "She was completely infested with fleas," Cressman said. "She was clearly neglected." Molly had bald patches all over her body, and weighed only 19 pounds, far less than what she should have. But despite everything she'd been through, she still looks up at her rescuers with nothing but love and loyalty. "She is completely and fully trusting of humans which is incredible, given her ordeal," Cressman said. Molly's caretakers at the shelter have been feeding her small meals, so they don't shock her system, and in the weeks since she arrived, she's reached a healthy weight. Now the next step is to find her a home. 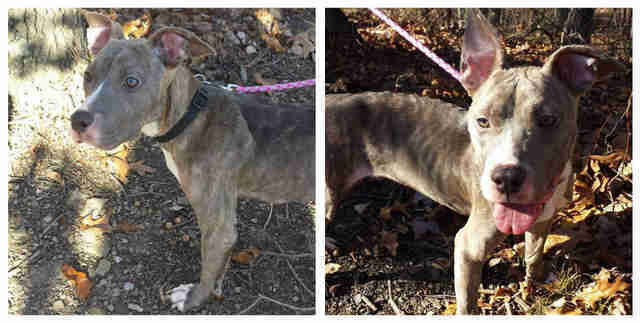 The good news is, Molly already has a potential adopter on the horizon, and it's someone who's already adopted a pittie through the Lawrence County Humane Society. "He came in and absolutely fell in love with her," Cressman said. So Molly could well be on her way to a brand new home with a real dad, and a doggie sibling. But the most important thing is that, no matter what, she's getting a chance to be a happy dog, which is something she almost missed out on. "In her most crucial time she was neglected," Cressman said. "Now she has to re-learn how to be a puppy." If you're ready to add a pet like Molly to your home, visit your local shelter or check out Adopt-a-Pet.com.